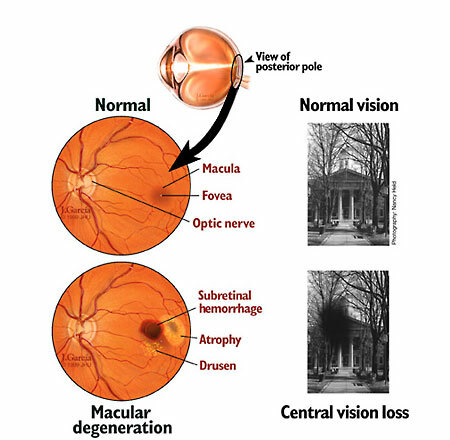 There are many factors related to the condition known as Macular Degeneration. The most common cause is a circulatory problem that often increases with age. The macula itself has a very high requirement for proper nutritional elements, oxygen, and the elimination of waste products in order to function properly. Circulation problems reduce the supply of oxygen and nutrients to the macula and will cause a dysfunction in the macula and, ultimately, its degeneration. There are two forms of the disease – the wet, more commonly the dry form. In the dry form, there is a breakdown or thinning of the retinal pigment epithelial cells (RPE) in the macula. In the wet form, the membrane underlying the retina thickens and then breaks. While there is no standardised treatment for the dry form of AMD, there are natural treatments that can help, especially when it comes to preventing both types of AMD. Some studies have shown that acupressure can enhance the cellular ATP (Adenosine Triphosphate) synthesising capabilities in the retina, helping to improve visual acuity for AMD patients. There are also some herbs that may have beneficial effects for the prevention and management of AMD. These include Bilberry, which contains active antioxidant compounds, and also strengthens the capillaries and reduces bleeding in the retina. Microcurrent stimulation is one of the main acupressure techniques available to treat AMD. There appear to be no testimonials from people who have used the Health Point for wet ARMD. Why do you continue to promote this product for this eye disease.? Hi Nicholas, The HealthPoint can be used successfully for basically any condition that acupuncture itself treats. It has been successful for many eye conditions, including both types of ARMD. Testimonials haven’t always in the past been easy to collate, but this is something that we will be concentrating on doing more specifically for all our websites, including our main http://www.goodhealthnaturally.com website. The manual will provide the right steps and points to help with this type of condition, and we advise using it alongside our AMRD health plan, which you can find here: http://www.goodhealthhelpdesk.com/index.php?/HelpDeskDirect/Knowledgebase/Article/View/1927/74/age-related-macular-degeneration-health-plan. Also, we advise using our free coaching service, so that we can monitor your progress and help you with any further questions. You can find more info at http://www.MyGoodHealthClub.com.